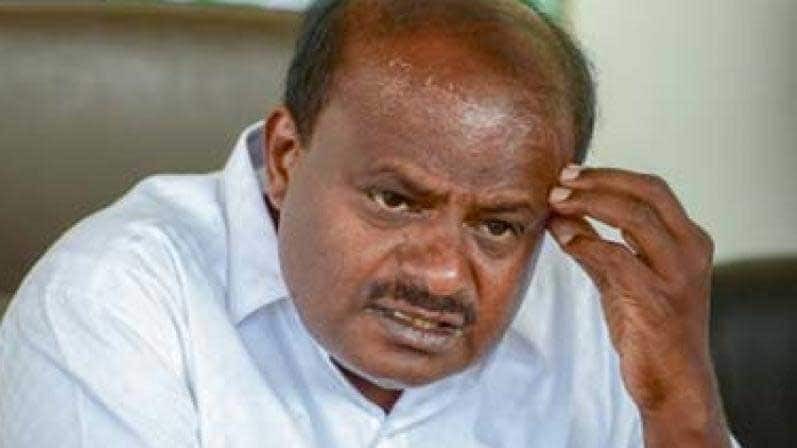 BENGALURU: Karnataka Chief Minister H D Kumaraswamy said Thursday he will not plead for support with those Congress leaders who are against his son Nikhil Kumaraswamy’s candidature as coalition candidate from Mandya in the Lok Sabha polls. Taking a dig at those opposing Nikhil, the Chief Minister said “those who are originally from the Congress have already extended their support and JD(S) workers are efficient to ensure his victory. “Some leaders in Mandya have gone ahead from the backdoor. It is not necessary for me to talk to them now. My workers are efficient, instead of trusting those backstabbing, trust those who work honestly. I’m not blaming everyone,”Kumaraswamy said in response to a question about him personally seeking support from Mandya Congress leaders. “Among the original Congress men, many of them are with us… But there are a few, I know…Situation will not come for me to go before them and plead, there is no need of it also,” he said. “With their own adamant behaviour, if they still want to go away with an intention to take revenge, good, they can work anywhere they want,” he added. The Chief Minister’s sharp reaction came a day after several Congress leaders in Mandya extended their support to independent candidate Sumalatha Ambareesh despite their party denying her a ticket. The Congress’ move to cede the seat to JD(S) is being vehemently opposed by leaders in Mandya, with a few even expressing openly their support to Sumalatha, widow of actor-politician Ambareesh. Ambareesh had early won on Congress’ ticket from the constituency. It is a high stake battle for Kumaraswamy and JD(S) as Mandya had remained the party bastion for long. The party also won the entire eight assembly segments in the Vokkaliga stronghold during the May 2018 assembly polls. For the coalition to emerge as a formidable opposition to the BJP and win more number of seats, it is crucial for theCongress to transfer its votes to JD(S), and vice versa, including Mandya. On Deve Gowda contesting the polls, Kumaraswamy said “There is pressure from several leaders on him to contest the polls, but he has not yet decided whether to contest or not. There is still no clarity in him whether to contest or not. If he decides to contest he will either contest from Tumkur of Bangalore North,” he said. Kumaraswamy asserted there was no issue or confusion on constituency for the former Prime Minister, but there was pressure from every where. Both his elder brother Revanna and nephew Prajwal wanted Gowda to contest from Hassan as this will be his last election, he said. “Gowda wished to contest his last election from Hassan, but as he had promised the seat to Prajwal three years ago, he doesn’t want to go back on the decision now,” he said. Prajwal Revanna, the other grand son of Deve Gowda has been announced as JD(S)’ candidate from Hassan, the family turf of the party patriarch and the seat he has been representing. The Congress and JD(S) have decided to launch a joint election campaign in the presence of Congress president Rahul Gandhi on March 31, either near the old airport road or near Nelamangala, by gathering about 5 lakh people, Kumaraswamy said.